There are 6 blog entries for November 2015. Wednesday, November 25th, 2015 at 6:00pm. It's hard to believe how quickly 2015 has gone by! With just over a month left in the year, there is a lot to look back on and be so very thankful for! 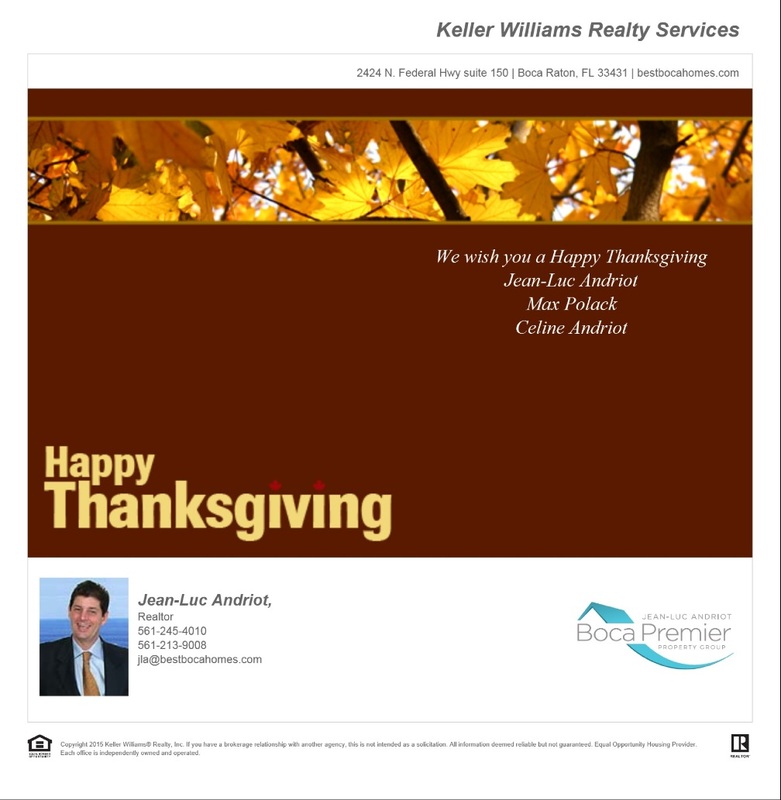 We would like to wish everyone a very Happy Thanksgiving! We hope you had a wonderful year full of personal and professional growth, adventures, and many things to look back and be grateful for! We have helped many great buyers and sellers this year as our business continued to grow and we would like to thank all of you for letting us create opportunities through real estate for you! May your holiday be full of delicious food, friends, family and great memories! Friday, November 20th, 2015 at 12:00pm. In 2015, the interior design trends of luxury homes in Boca Raton are increasingly reflecting the personalized needs of home buyers. In order to attract new buyers, many luxury homes in the Boca Raton area are offering new design features for every room including the bathrooms, bedrooms, kitchen, living room and even the outdoor areas. These designs feature a combination of traditional materials, as well as, eco-friendly materials, textures and other decorating elements. Here are some of the more popular interior design trends that you will find as features in Boca Raton homes. Thursday, November 19th, 2015 at 5:45pm. To thank the staff of Townsend Place condominium in Boca Raton today, Jean-Luc Andriot and his team organized a thank you lunch for all the employees of the building. Jean-Luc's culinary experience allowed him to serve a traditional Thanksgiving dinner with a twist of French taste. On November 19th 2015, we held the sit-down lunch at 500 SE Mizner Blvd, Boca Raton, FL 33432 for about two dozen people. In the video, you can see Jean-Luc working hard in the kitchen... The staff of Townsend Place had a great meal and were able to socialize with each other. Thank you to the Townsend Place management for all their help! Thursday, November 12th, 2015 at 12:46pm. In Boca Raton, 33432 is a prime zip code. It encompasses downtown Boca Raton, all the way East to the intracoastal and the ocean. These are usually luxury condos. Downtown Boca is a 344-acre, pedestrian-friendly district of shops, businesses, restaurants, entertainment and luxury homes and condominium. Monday, November 9th, 2015 at 4:48pm. The single family homes real estate market in Palm Beach County is accelerating. The inventory is becoming scarce both in availability and number of days they remain on the market is dramatically decreasing. Consequently sold prices have increased and there are fewer homes available for sale. Tuesday, November 3rd, 2015 at 3:04pm. November 2015, Keller Williams Realty monthly real estate statistics. This very short video (1:09 minute) is going to give you the 3 national real estate statistics for this month.